“Nobody told us we have to study our lives, make of our lives a study.”“Nobody told us…”Language links us through time illustrating the then of that time and the now of…well you know that old phrase of hope in the powers of presentism to obliterate the distracting melancholy of regret.Then and now. What a poem means in 1977 or 1981 and what now in 2014? But this recent interview reminds me of this Adrienne Rich quote from her 1978 poem “Transcendental Etude” from her collection The Dream of a Common Language: “Nobody told us we have to study our lives, make of our lives a study.” I might have read this two years after I left a very sad and bad marriage and three years after my father died by suicide. My own sense of myself had collapsed. It was a hard time. Of course. I worked at various jobs and returned to university part-time to study. Reading and writing and my friends and the Women’s Liberation Movement saved my life. I might have read this Rich poem in 1978 but I think it was later when I saw Adrienne Rich and Nicole Brossard give a talk in Toronto on my birthday in 1981. 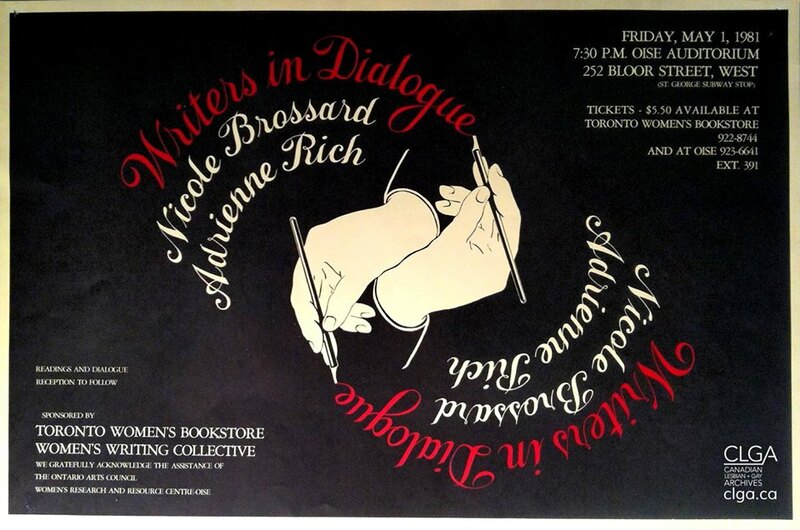 Then I was reading Adrienne Rich and Nicole Brossard in earnest. And writing a dissertation about feminist poetics was my translation of the phrase by Adrienne Rich. There was nothing academic about it. Recently this line emerges in an interview discussion of anti-racist pedagogy and it reminds me of a way to upend the kinds of tensions that can emerge in classrooms where diversity informs the writing and lives of students. Peggy MacIntosh wrote about white privilege and male privilege in a famous 1988 essay. And I’m reminded how white privilege, the women’s movement and hard work helped me get a university job. Peggy MacIntosh is still at work at 79 years developing the anti-racist work she wrote about decades ago. In this interview, she reminds us how compassion and probing the limits of our understanding can be key to our work in the classroom. It is difficult to live up to the ideal but try try again is a teacher’s thematic. Q: “You seem to relate to the idea of privilege in a very compassionate way. But isn’t that hard, since the effects of privilege are so unjust? Isn’t it natural for privilege to make people angry, rather than openhearted? I imagine Tal Fortgang in a college seminar, and the rancor that must accompany conversations about privilege in the classroom. How do you defeat that?